No, this is not potica the way your grandma (babica) used to make it. But this vegan adaptation is based on the written recipe I inherited from my mother, who was inspired by her own mother's example. My grandmother would probably approve of vegan potica, if she were around today. She was unusual for her time and place. Sixty years ago, unlike most working class women in Cleveland's Slovenian community, she read Prevention Magazine and kept her own organic garden in the back yard. She was open-minded and politically progressive, as well. Pretty impressive for an immigrants' daughter with a fourth grade education! I started experimenting with vegan cuisine last December, when a couple of the younger generation in my family started to shift into plant-based eating. But I concentrated on cooking rather than baking. 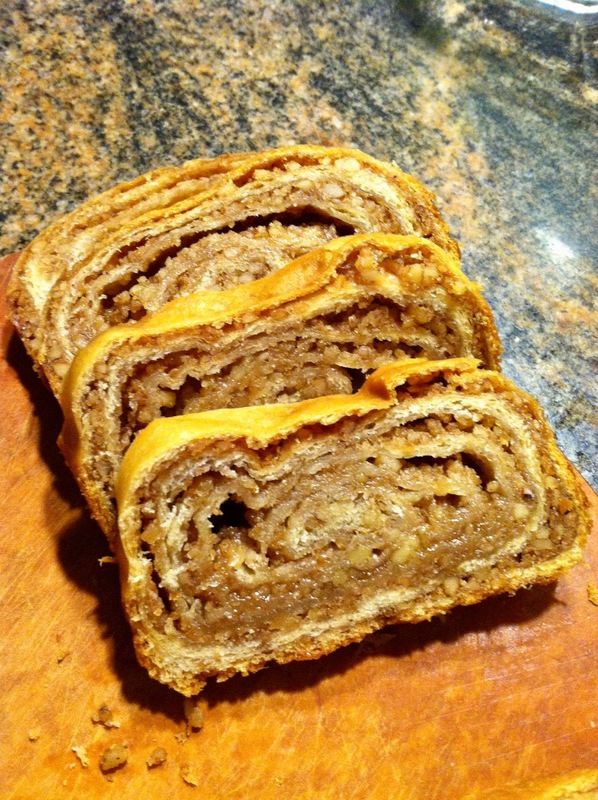 This past weekend, with Christmas approaching and a holiday potluck to attend, it seemed like a good time to attempt the ultimate challenge for a Slovenian baker: vegan potica. I knew it could be done. I had sampled vegan potica just once, right at the source: the farmers' market in Ljubljana, Slovenia's captital. It tasted pretty good, although not much like my family version. Unfortunately, none of these recipes seemed like good bets for duplicating my family's beloved walnut-honey potica, because they all used a less rich, more bread-like dough. My family's style of Slovenia's most famous dish presents a definite vegan challenge, because it is so rich in ingredients that are off-limits: butter, eggs, and sour cream in the dough, plus copious amounts of honey in the filling. I thought back to last December's gluten-free potica experiment, when I turned to adaptations of brioche or babka, since they seemed closer to the dairy-rich dough in my family recipe. 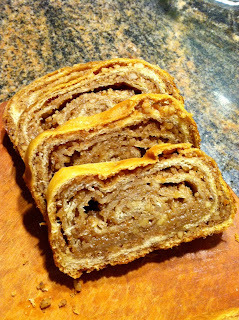 So I started to explore vegan versions of brioche and babka. But then it hit me: Why not just use my own family recipe, with the plant-based substitutes other vegan bakers favored? The details are in the recipe below. It was easy to come up with non-dairy versions of butter, milk, and sour cream. I have noted the specific products I used, in case it made a difference. The two bigger questions were how to replace the eggs and honey. My solution involved two ingredients that will be new to many readers. For the honey, I tried two different replacements. 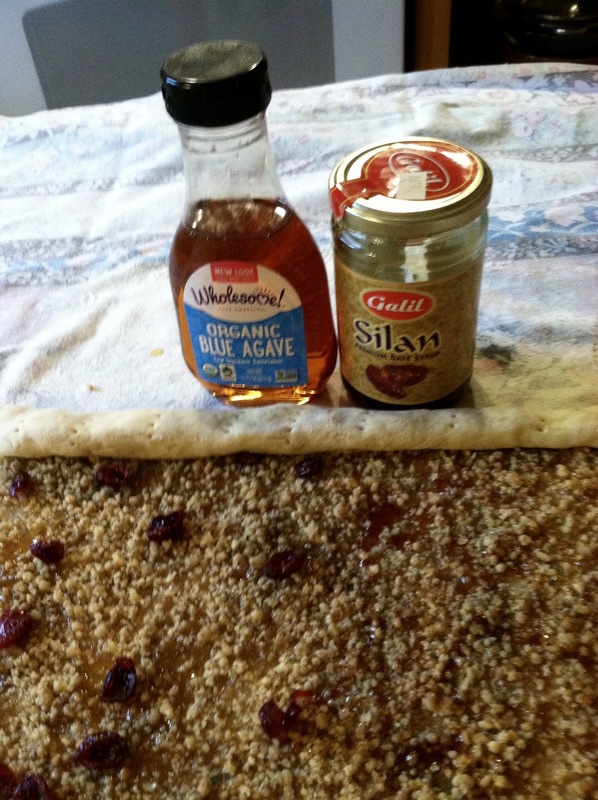 Agave nectar is widely available and works fine. But my husband and I preferred the more complex flavor of date syrup, sometimes known as date honey--or silan, to Israeli cooks. 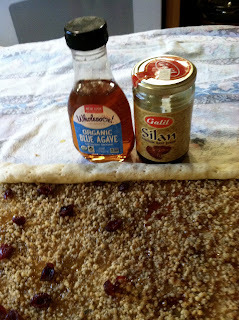 I already had some on hand, after purchasing a jar in our local Middle Eastern market to make an unusual version of honey cake for the Jewish holidays in the fall. In considering possible egg substitutes, I ended up in a surprising place: draining a can of garbanzo beans. Aquafaba--bean water--is all the rage in vegan circles, but it was new to me. I was skeptical of claims that this simple ingredient has amazing properties. Then I watched what happened when I added it to the creamed butter-sugar mixture and started beating. You know that moment when adding the egg makes a batter or dough come together? One minute, the mixture is curdled, and then everything smooths out and the volume starts to increase? That is exactly what happened when I added a few tablespoons of bean liquid. I had imagined that the vegan dough might more difficult to work with, but my experience was the opposite. It was easy to knead, although it had an unusual feel: very soft, even damp, but not at all sticky. I needed much less additional flour than usual for kneading. This dough felt very springy and "active." In fact, it began to rise almost immediately! I even put it in the freezer briefly to slow the process down, then refrigerated it, as usual. 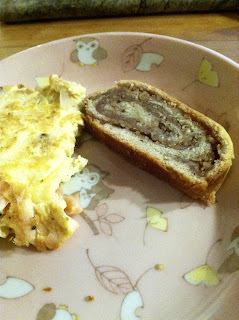 After chilling, it remained a little softer than usual, but it rolled out beautifully. I don't know what combination of ingredients created this mysterious alchemy. But I suspect the aquafaba had something to do with it. I do encourage you to give it a try. For the less adventurous, I note other possible egg substitutes in the recipe below. So what were the results? Impressive. The vegan potica was a hit at the party--even though I had broken my own rules to get it done in in a single day. I shortened the overnight refrigerator rise to just a few hours. I had to serve it a few hours after baking, instead of waiting a day. Also, I had been overly cautious with this new dough and had rolled it thicker than usual. So the photo below, from the party, doesn't look as pretty as my usual efforts. But that haunting flavor was there. And there was no trace of bean flavor. When I baked the second batch, the loaves rose higher, after the proper overnight refrigeration. 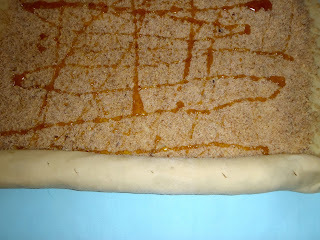 I also felt more confident with the dough, so I rolled it much thinner. Those loaves went into the freezer, so I had to wait to see how they turned out. I consider this a work in progress. 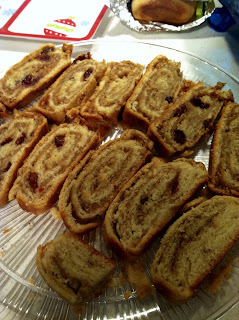 But I am posting the recipe now, at the height of potica season, to make it available to readers who might want to give it a try--or even adapt their own family recipes. Post Christmas Update: Sure enough, that second batch was perfect, even after freezing! See the photo below, with recipe following. In a large bowl, combine the butter substitute and sugar and beat. Add aquafaba (or other egg replacer) and beat. Finally, add add sour cream substitute, vanilla, and lemon rind (if using). Mix well. In a small bowl, proof yeast in warm cream or milk substitute and sugar. Add yeast to the first mixture. Mix well. Sift flour and salt. Add to the mixture in the large bowl and stir to combine. You should have a soft, sticky dough. Turn it out on a floured board and knead until smooth and elastic. Divide dough into two even balls and flatten them slightly. Wrap in plastic wrap. Refrigerate overnight. 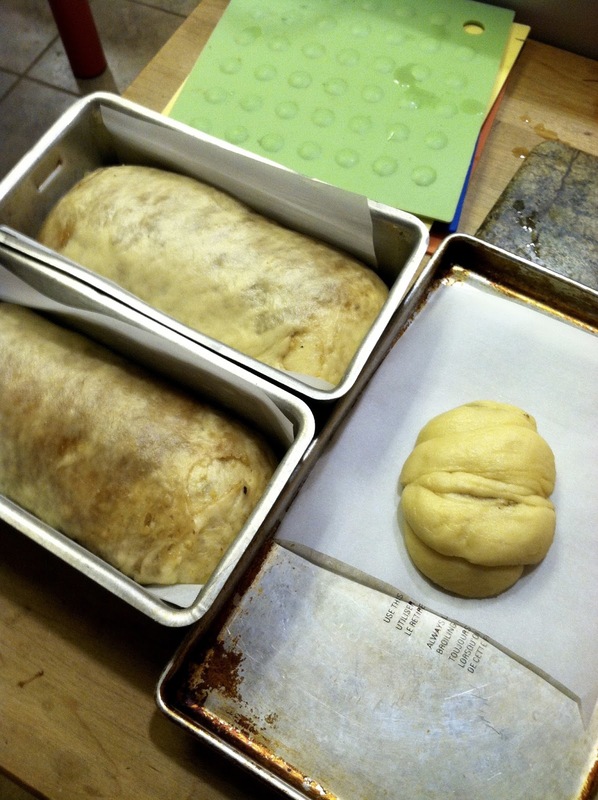 It is easiest to use a floured cloth to roll out the dough. Remove a ball of dough from refrigerator and place it on floured surface. Roll it into a rectangle. The dough should be thinner than pie crust but thicker than strudel or phyllo. I usually aim for 15 x 26 inch rectangle and in recent years have aimed for thinner. 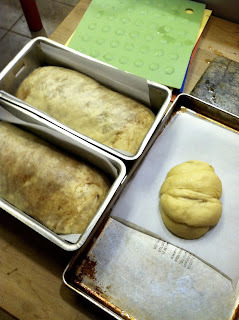 With this dough, however, I ended up with a smaller rectangle, closer to 14 x 20 inches. Repeat with remaining ball of dough, for a total of four small loaves. Let potica rise 1-1/4 hours. (Note: Loaves don’t rise much.) Bake at 350 degrees for 25 minutes. If necessary, bake for 10 minutes more at 325 degrees. Let cool before slicing. To store, wrap in aluminum foil. Potica tastes better the next day. It stores well. It also freezes well. You rock! This is Rachel from the Slovenian Genealogy group, and I'm still trying to figure out my options for making potica. I've never made it before, and I have a zillion food sensitivities. I want to make something I can enjoy but I don't want to ruin it with substitutions! I was wondering whether I could substitute aquafaba for the eggs, so imagine my delight to find you'd already tested this! What did (or didn't) it do for the dough in terms of richness? Hi Rachel--thanks so much! It's funny, I was just reading over my potica posts and remembering how good that vegan potica was, and how amazing it was to discover aquafaba Actually feel kind of sad there is no longer a need to make it, because the family member (older son's partner) whom I'd been told was vegan is in fact just a vegetarian with a daily intolerance :-) So she can tolerate eggs and doesn't object to honey. I didn't really notice that the dough was less rich, although it must have been to some extent, since aquafaba mus be fat free, right? One way to compensate I seem to have done, without thinking about it: Using a nondairy cream rather than milk (what the original recipe uses) for dissolving the yeast. I hope you do try the recipe--let me know how it turns out. Happy Holidays! So excited to find this and see you have Cleveland ancestors! I am a Clevelander with Slovenian roots (well, 25% but it's the part I most closely identify with) and grew up with my great grandmother's patica that I have missed since going vegan. And I love you are using aquafaba as the egg sub instead of chia or flax! Can't wait to make this! Thanks for commenting! Let us know how it works for you!